I have been spending the last week thinking about my new weight loss plan, how I want to approach it, how many calories I should eat, should I go low carb? I think what it all boils down to is I should eat less food and move more. Under my "Food Plan" tab, I outlined a diet for myself when I first started the blog that I think was pretty good, but since then I have found that there are certain foods that I should avoid if I want to lose weight. My best success since starting this en-devour was all through April, when I cut my carbs. I really didn't remember how low I cut them until I took a look back through my posts, and I found that I was still eating around 70-80 a day, and I was having a pretty substantial cheat day on the weekends. I kept thinking back to that time and remembering eating tons and tons of salads, but when I took a look back in actuality, I was eating a lot of exciting dishes. Low Carb Tofu Scramble was a staple of just about every day. There were TONS of beautiful vegetables. I could still have taco night. My weekends were full of filling salads. 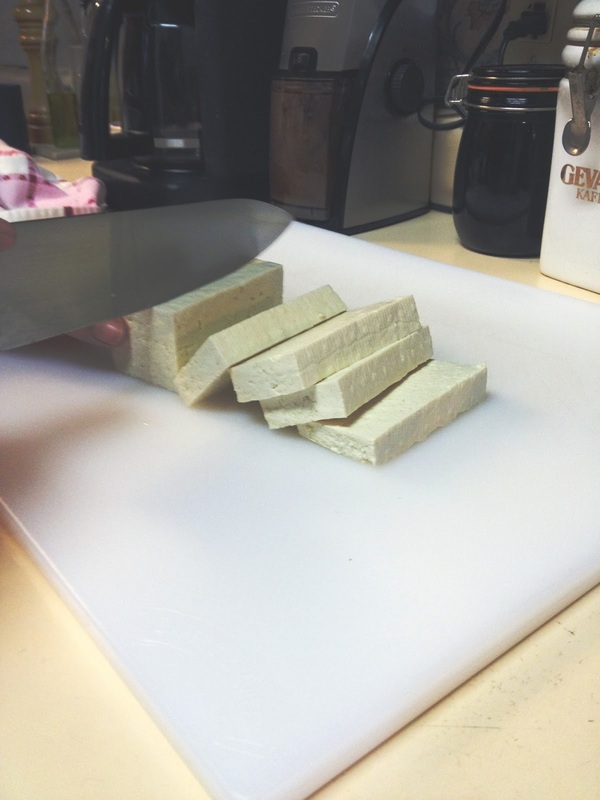 I got creative with Dark Chocolate Balsamic and Tempeh. Tofu and sauteed veggies kept it simple. I still had cheat nights at US Pizza. I started my love of breakfast salads. Pumpkin seeds started showing up in everything I ate. Eggplant salads and eggplant stir fry happened a lot. Zucchini noodles replaced pasta in a romantic dinner. So, I definitely want to be very sensitive to the amount of carbs I eat everyday, because so often vegans can eat too many. My ultimate goal will be to stay under 100 grams a day, trying to get lower if I can. I calculated my calorie goal at MyFitnessPal, which recommended 1280 calories a day without workouts. I don't want to be obsessed with calories, so I'm going to shoot for 1300-1500 a day, depending on workouts, with 1 cheat day per week. I really struggle with what day this should be, Saturday or Sunday, but I think ultimately it should be Sunday. I would love for my cheat day to have a good workout to go along with it, like a long run or a Pinnacle Mountain climb. I have a hard time with snacking and putting things in my mouth when I'm not thinking about it, so I'm going to try to eat 4 TIMES A DAY, 3 MEALS AND ONE LARGE SNACK. I'm also going to try to make my breakfast jam packed with protein, so there will be a lot of vegan protein powder too. Lunches will more than likely be out with my office, so I have to make good, healthy choices. Snacks will need to fuel my afternoon workouts (sometimes double workouts), and dinners will need to be light, since they are usually late at night. I will still be testing recipes for Going Vegan, and I'll also be cooking a lot out of Isa's Appetite for Reduction, so I will try to keep the carbs and calories low. If I am eating something that might be higher in either, I will try to keep my portions small. In the end, it's all about balance, and it's all about a diet that I can stay on and be happy on, because while it is hard to lose weight, it's even harder to maintain that weight loss. This blog is about being healthy, and I don't want to lose weight in an unhealthy fashion. I will try to give a calorie/carb/protein break down per meal when documenting them here, and I hope that will be helpful and informative to anyone else struggling to lose weight on a vegan diet. One last thing I need to address is alcohol. It's definitely an inhibitor to my weight loss at times, but I know that I don't need to cut out drinking entirely to lose weight. So, I will be trying to abstain during the work week, because it's just wasted calories. I will allow myself to drink within my calorie limit during the weekend, and I will try to pick drinks that are low in carbs as well as calories. Ultimately, I will tweak this as I go, but I need to get more serious about weight loss. I don't think anyone needs to strive to be stick thin, but I want to be strong and lean, and focusing on my food will help with that. Anyone that has been reading since the beginning knows I have my ups and downs, and I plan on getting more focused from this point going forward. I like the new diet plan - seems easy enough for even me to follow. And in reading the tofu scramble recipe, I agree with you that dividing the portions first really helps. Last week I decided to actually measure my salad dressing. I filled 8 tiny containers with Annie's goddess dressing, my favorite. I was eating alot more than 2 tablespoons. (Darn these eyeballs.) After a week of measured dressing - I LOST weight! Now, I'm going to work on low carbs. We can do this! Thanks for leading the way. So Funny! I started the Eat to Live Plan today! It's part of my Thirty Something Gross Habits Buster Six Week Plan. There was a study that says 45% of out lives are habitual. Good Habit=Happy Life. Your post hits home with me. I think at times we do need to go back and look at our diet and make changes here in there. I have let beer back into my diet, and I know on the weekend it is fine, but at the same time - I like to snack when I drink, and that's not good. Great post, thanks! It's strange how easy it is to let a few things back in until you are way away from your eating goals. I need to set up some good, life long habits. Hi Dana! I like your blog! I found you via Vegan Crunk. Bianca has been my best friend since we were 13! My husband, Drew, and I are vegan in Little Rock as well. This post hit home with me, as we are both trying to get our diet goals back on track and maintain a more consistent exercise plan.